Participating schools at the 2018 Standard Bank Kearsney Easter Rugby Festival highlight its prestigious status amongst players, coaches and supporters of schoolboy rugby. At yesterday’s (Wednesday) launch of the 11th festival the strong line-up of participating South African school teams, renowned for their rugby pedigrees, was announced. Three local KwaZulu-Natal teams will participate this year: Glenwood High School, Durban High School and hosts Kearsney College. They will join HTS Middelburg, Welkom Gimnasium, Pretoria Boys High and Hoërskool Noord-Kaap (Kimberley); the Eastern Cape’s Dale College (King William’s Town), Queen’s College (Queenstown), Selborne College (East London) and Hoërskool Framesby (Port Elizabeth); together with HTS Drostdy from Worcester. The festival takes place over three play days: Thursday 29th March, Saturday 31st and Monday 2nd April. It promises exciting running rugby, set in a family environment on the Kearsney College campus at Botha’s Hill, between Durban and Pietermaritzburg. 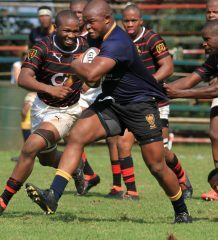 Many gifted players have been discovered by talent scouts at previous Kearsney rugby festivals and they have now progressed to playing for the Springboks, SA Sevens, Sharks and other provincial teams. Etienne Fynn, head of the Sharks Academy, said the festival played an important role in exposing the quality of available young talent from around the country. 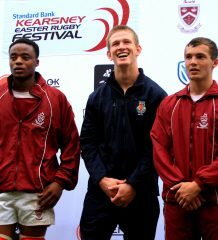 “The Sharks Academy is proud to be associated with the Kearsney Easter Rugby Festival. The length of our involvement is testament to its on-going high standards and continued focus on the camaraderie and ethos of the game. Only at these festivals is the weekly grind of school derbies removed, and players can be allowed the freedom to play the game without that very obvious pressure,” he said. Fynn said that talent scouts from The Sharks and Sharks Academy would be on the lookout during the three play days of exciting fast-paced action. Kearsney headmaster Elwyn van den Aardweg said he was delighted to again announce Standard Bank as the festival’s headline sponsor. The bank had partnered with Kearsney in a multi-year deal which was testimony to the stature and prestige of the festival. He said the event had emerged as a highlight on the sporting calendars of lovers of top-class schoolboy rugby. 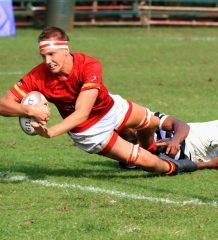 “Thousands of supporters from KZN and further afield flock to Kearsney’s beautiful campus over the Easter weekend to savour the spectacle of running rugby, to enjoy the special family atmosphere on our beautiful campus and to experience the fun and excitement of the festival,” he said. Simphiwe Khoza, KZN head of retail banking at Standard Bank, said they looked forward to seeing young sportsmen displaying the integral characteristics necessary to reach personal, group and career goals. These characteristics were the same as those Standard Bank strove to uphold, he said. Festival organiser Mouton Bezuidenhout said he was delighted with the strength and quality of teams taking part this year, ensuring that the festival continued as an important event for supporters of top-class schoolboy rugby, whilst also providing the obvious benefits to the game in the province. “We have another incredible line-up of talent participating at this year’s festival – and supporters will definitely not be disappointed. This is schoolboy rugby at its very best,” he said. Kicking off play each day will be a match between primary school teams, invited to showcase their skills and to enjoy the opportunity of playing in front of large crowds. Participating sides are Highbury Preparatory, Hillcrest Senior Primary, Umhlali Prep and the u13 KZN Ibutho/Mark Godefroy development team. Numerous food outlets, a refreshment tent and KidZone will ensure spectators can enjoy a fun-filled family-orientated Easter weekend. Entry is R25 per person with ample parking available.